Wonderfil Master Quilter 3-Ply 40wt Polyester Thread is a long-armer's dream! 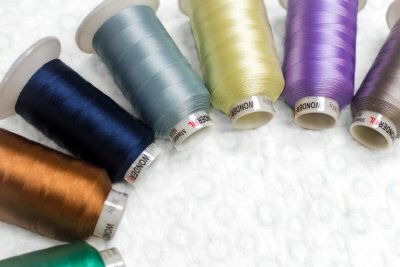 Soft and supple to the touch, completely lint-less with a fantastic cotton sheen, and crafted specifically for high speed machine quilting and multi-directional sewing, Master Quilter is ideal for longarm, midarm, and domestic sewing machines and gives a perfect stitch quality even at high speeds. It is conveniently available on 3000yd cones so that you have the tools for your project from start to finish.